The 2006 SNF Airshow was another great experience and one we at Dynon truly enjoyed. The excellent weather, spectacular airshow and new aircraft on display all contributed to our excitement. Our 3-person crew was kept quite busy throughout the entire show demonstrating our expanding product line and answering questions. 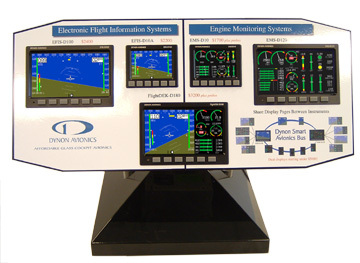 Our revised demo instrument panels were equipped with all 5 instruments that we now offer. We are quite proud of the fact that we've shipped three new products (EFIS-D100, EMS-D120 and FlightDEK-D180) over the past 6 months. Our engineers and production workers have been extraordinarily busy and we see no rest ahead. We've come a long way from our first product and airshow. It was also thrilling to see so many Dynon products installed in the aircraft on display throughout the airshow. Many visitors to our booth commented on this fact as well. The affordable nature of our glass cockpit avionics are attracting many aircraft designers and dealers towards offering our systems as upgrade options. While we might logically be driven to believe that our state-of-the-art avionics are only suited for modern aircraft, we are often amused to discover them in unexpected cockpits ranging from old biplanes, cubs and even a flying B25 bomber! One of the highlights of the airshow was the truly spectacular performance of the F-22 Raptor fighter jets as they made their very first public debut. 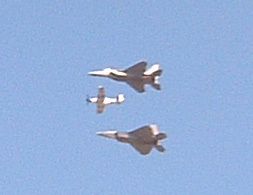 It was impossible to escape noticing the incredible power and noise as they made their high speed, low altitude passes. We all marched to the far end of the field to get a good look at these incredible aircraft. We'd, of course, hoped to peer into the cockpit to see what sort of nifty instrumentation they had on board but the armed guards persuaded us to keep back a comfortable distance. Nevertheless, they were pretty awe-inspiring and surprisingly large. They are especially large when compared to the P51 that they flew alongside during part of the airshow. Competing for attention with the Raptors was another reptilian ground-based bird. 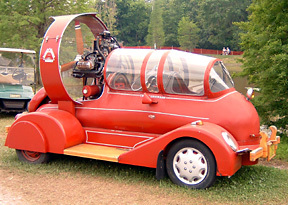 This craft was clearly intended for those who just couldn't get enough cockpit time in the skies. We want to express our appreciation to all those who dropped by our booth. We hope we answered all your questions and allowed some hands-on time with our instruments. Thanks too to all those we met with while we toured about the grounds and flight line. It is often said of those attending airshows that they are simply the best people you could ever associate with. We'd have to agree and this year's group was no exception. The SNF air show is among our favorites and we look forward to 2007 and even more great memories ahead.